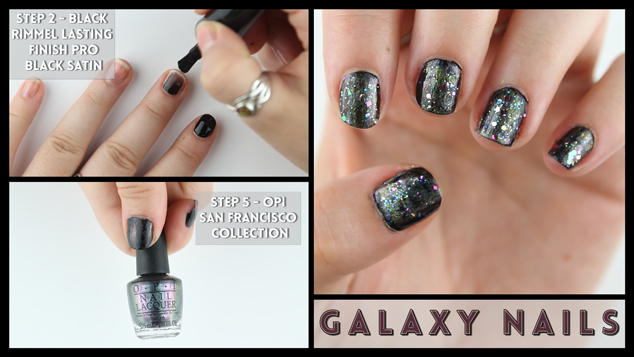 Its been a while since I have done a nail art tutorial but I was recently sent a lovely little set of polishes, the OPI Nail Lacquer San Francisco Collection, from Click Fragrance and it inspired me to do a galaxy nail art design. This design includes 2 polishes from the set, one of the other shades can be seen in my recent post here. You can use other metallic and reflective polishes to achieve this look to give your nails a real space vibe. In my recent post I did some ombre henna inspired nail art which was far more difficult and intricate and would be quite hard to do on your own nails. A lot of my feedback was wanting nail art that you can do on your own on both hands. This design definitely can be done on both hands with ease, as shown in my video and gives really effective results. Building up the layers gives your nails a bit of depth with different tones and shimmers. The effect looks similar to foil effects and the contrast against the black undertone polish makes the colours pop out. Add a shimmer polish at the end to give the star look, I used 2 polishes, the Essence 103 Space Queen and the Essence Special Effects 02 Circus Confetti so that there were different sized glitter. I hope you like my video and please like and subscribe to my Youtube Channel! Let me know in the comments below future nail art videos and other beauty related videos you would like to see on my channel.